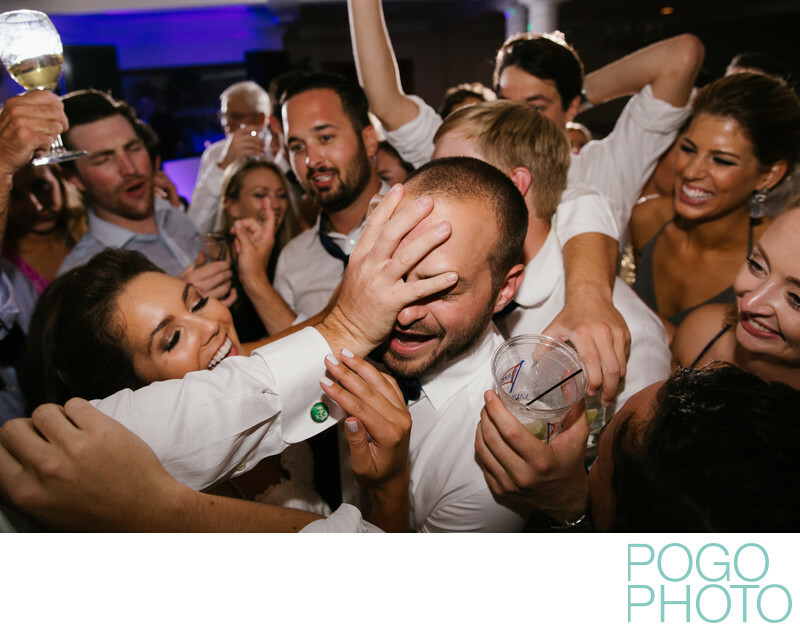 This humorous image of a guest’s hand on the groom’s face was taken on the dance floor at the Lauderdale Yacht Club in Fort. Lauderdale, Florida. Feeding off the energy of a dance floor helps us feel like we are in the moment when attending receptions. This particular celebration was a bit more raucous and energetic than usual, as nearly everyone in attendance came to party. The bridesmaids and groomsmen, each numbering in double digits, were upbeat and excited for the entire day, even during a reserved ceremony at a nearby Catholic Church. Their individual personalities shined when we took photos of each of them with the bride or the groom, but their combined enthusiasm was what brought this party to another level. Even before dinner was served, the lights dropped, and the music started, multiple speeches from half a dozen wedding party members had the room cracking up with inside jokes and playful observations. Being seated on only one side of a long table, the scene was reminiscent of the Last Supper, had the Apostles opted for an air conditioned space complete with acoustic tiles. Being in the action allows us to see and document what we call “in-between moments,” the segments of the day between directed setups or camera-aware posing. The natural and relaxed behavior of our subjects is the primary reason the majority of our portfolio appears so genuine and intimate, because it absolutely is. Taking part in instances like the one displayed in this image is one of the more amusing and enjoyable parts of our work. He was having a blast, singing along to the music and dancing with his wife when everyone on the dance floor descended upon them at the direction of the DJ. Slightly inebriated, one guest kept their balance by using the first thing their hand could grab: the groom’s face. We love how no one seemed to care or even notice that someone just slapped his forehead. That would not go over very well with a random person walking down the streets of Ft. Lauderdale, but being among family and friends (and half a bottle of whiskey deep) numbs the effects of such a move. The Lauderdale Yacht Club is on the shores of the Intracoastal and this wedding day coincided with a phenomenon known as the king tide. The guard at the gate warned us not to park in any low-lying areas but we did not think much of it until after 10pm. Under the full moon, the tide rose so high that it crested over the banks and flooded the parking lot. One vendor had to jump from a tree into the back of his pickup truck and crawl into the truck’s cab through the back window. Our trusty car had already made a trip to Alaska and back and it was not about to wave the white flag just because of a few feet of water. Gingerly loading all of the camera gear into the truck while the water was actively rising around us was a memorable experience. Ten blocks inland the sea transitioned back into asphalt, leaving behind a distinctive and memorable experience that occurred nearly an hour after the staged sparkler exit. Location: Lauderdale Yacht Club, 1725 SE 12th St, Fort Lauderdale, FL 33316.